Piccolo Preschool Nursery Celebrate its 10th Year Anniversary. 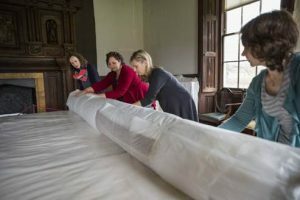 Six of the most important tapestries in the National Trust’s collection are leaving their home at The Vyne in Hampshire for a ‘bath’ in Belgium. The eighteenth-century ‘chinoiserie’ tapestries urgently need extensive conservation work. Historic repairs have begun to fail and the tapestries’ backings have warped, putting strain on the fragile fabric. The work will cost the charity in the region of £382,000, and The Vyne has launched an urgent appeal  to help fund the project, and ensure the magnificent tapestries can continue to be enjoyed by visitors to The Vyne. In June the textiles are travelling to the Royal Manufacturers De Wit in Belgium – the world’s leading restorer of tapestries. There, they will undergo a process known as ‘wet cleaning’, before returning to the UK for major conservation treatment, estimated to take three years. ‘Wet cleaning’ will see the tapestries laid out on a ‘suction table’ whilst a mist of mild detergent is gently drawn through the historic fabric to remove any dirt. After cleaning, the tapestries will be laid out and covered with cloth to absorb the moisture. Once dried, they will be carefully rolled up and transported back to the UK. Before the textiles are sent abroad, the team must ensure the tapestries won’t become damaged during this process. For that reason some of the historic repairs made using different materials and dyes are being taken off. This is to make sure the colours won’t run and that the patch repairs won’t shrink and put additional stress on the fragile fabric. The backings and edges – called ‘galloons’ – are also being removed, while rips and tears are being reinforced with extra stitches. By the time the tapestries ‘take the plunge’, they’ll have spent three months under the expert gaze of a textile conservator. The tapestries were woven c.1720 carrying on the legacy of Chief Arras Worker John Vanderbank. Fascination with the exotic was widespread thanks to the increased, yet still restricted, access to Eastern culture through expanded trade. The tapestries are an important result of the exchanges between the East and Europe. The tapestries depict scenes from eastern folklore and legends such as the Oath of the Peach Garden, which captures the moment when three ill-fated heroes swear their allegiance to the Han Dynasty in what has been described as ‘an expression of deepest loyalty in Chinese culture’. Further research has revealed that, while many examples of these tapestries survive, Vanderbank was able to produce them as a series of bespoke ‘one-offs’, allowing those who commissioned his work to pick from his cartoons and put each image where they wanted it. He was thus able to produce tapestries of varying sizes and designs from a pre-prepared style. 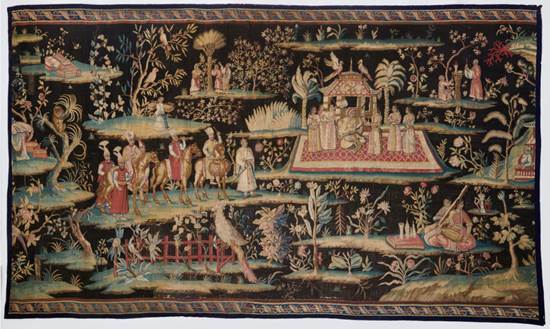 Depicting the East through the romanticised, exaggerated lens of the European explorer, The Vyne’s Soho tapestries are important markers in inter-cultural history. The tapestries have become even more significant in the context of today’s globalised world. The conservation project has received some financial support from the National Trust. However with a total of 250,000 hectares of countryside, 778 miles of coastline and hundreds of special places across England, Wales and Northern Ireland to look after, the Trust must look to the generosity of its supporters to meet the shortfall. Raffle tickets are currently on sale at The Vyne with a top prize of £10,000. Young families can also lend a helping hand and have fun at the same time by tackling the Lost tapestries trail on their visit for a suggested donation of £1 plus normal admission. UK taxpayers can make their donation go even further by adding Gift Aid. Over the next three years the tapestries will travel a combined distance of approximately 2800 miles (approx. 4500km). To prevent the heavy fabric from crushing itself in storage, the tapestries have to be rolled and hung with a supporting bar through the middle and supports at either end. Made from historic wool and silk the tapestries fade easily in daylight so they’re exposed to no more than 150,000 lux-hours of light a year. To put that in context, average direct sunlight levels are about 50,000 lux per hour, so the tapestries’ annual light exposure would be used up after just three hours of direct sunlight. An eighteenth-century European creation, these tapestries were historically described as being Chinese, but the motifs draw on Persian and Indian imagery. To mark the centenary of the murder of Tsar Nicholas II and his family at Ekaterinburg in July 1918, Romanov expert Coryne Hall talks about her new book To Free the Romanovs. Royal Kinship and Betrayal in Europe, 1917-1919. Beatrix Potter wrote and illustrated some of the best loved children’s books of all time. Most of us are familiar with The Tale of Peter Rabbit, but how many of us know the story of how it came to be written? This talk focuses on the creation of Beatrix Potter’s ‘Little Books’ and offers a fascinating insight into the life, art and writing of this talented Victorian woman. On Wed 18 July we will be launching a new group to the Tadley area called Basingstoke Disability ConneXions. 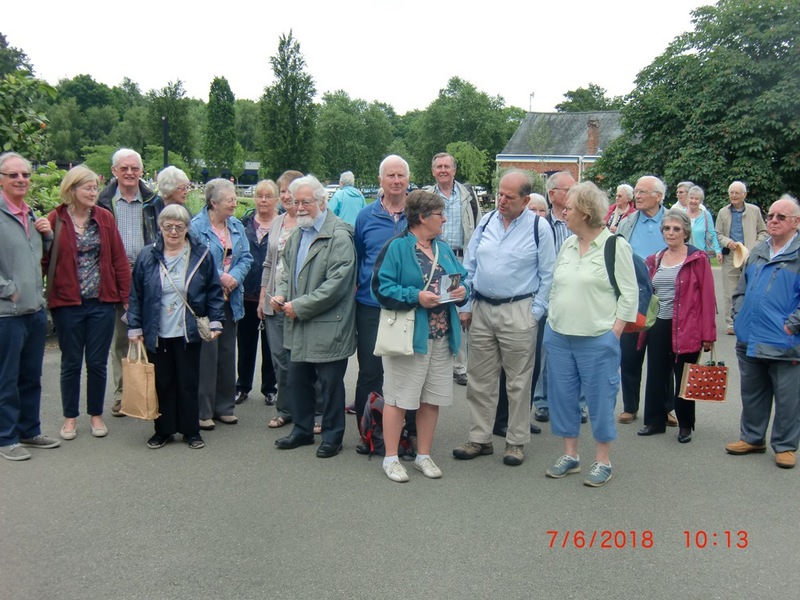 We have already been running this group in the Basingstoke town centre for 2 years, and have recently been awarded some funding by Basingstoke & Deane Borough Council to expand these services to more rural areas via an outreach programme. The new group will be officially opened by Cllr. David Leeks at 10am on 18 July in Tadley Community Centre, Newchurch Rd, Tadley RG26 4HN. We are pleased to be able to offer an introduction to meditation for all; followed by a talk from the disability caseworker at Citizens Advice, Tadley. The meetings are free to attend and we will be offering free refreshments and special ConneXions cakes for the launch event. Claudia R Cafarelli and Jane Sherwood, Directors of Piccolo Preschool Nursery, have taken a moment to reflect on the ten year anniversary. “We are celebrating our ten year anniversary!!! Piccolo Preschool Nursery, we would like to extend our thanks to all of our children, families, and employees for the ongoing relationships, dedication, support and trust you’ve placed in us. This milestone belongs to us all. Piccolo Preschool Nursery was founded in 2008 and has achieved a decade of high quality early childhood education for young children in the community and beyond. Throughout the years, Piccolo Preschool Nursery has been and is buzzing with many different learning activities such as fine & gross motor skills, social & emotional skills, and cognitive skills. Coupled together with parents/carers involvement, developmentally appropriate curriculum, highly qualified, dedicated staff, and program quality standards. Piccolo Preschool Nursery, we have built strong foundations for learning for our young children through the years. We are proud of what we have achieved over the last decade, it’s a time for all at Piccolo Preschool Nursery to reflect on where we have been and to reaffirm Piccolo’s Preschool Nursery ethos to provide high quality childcare; we really are passionate about early childhood education and strongly believe in the value it brings to the community and beyond. We will be celebrating this milestone by holding a Summer Fete on Saturday, 30th June 12:00 to 3:00 at the Chute Recreation Ground, Sherborne-St-John, all are welcome to join us. 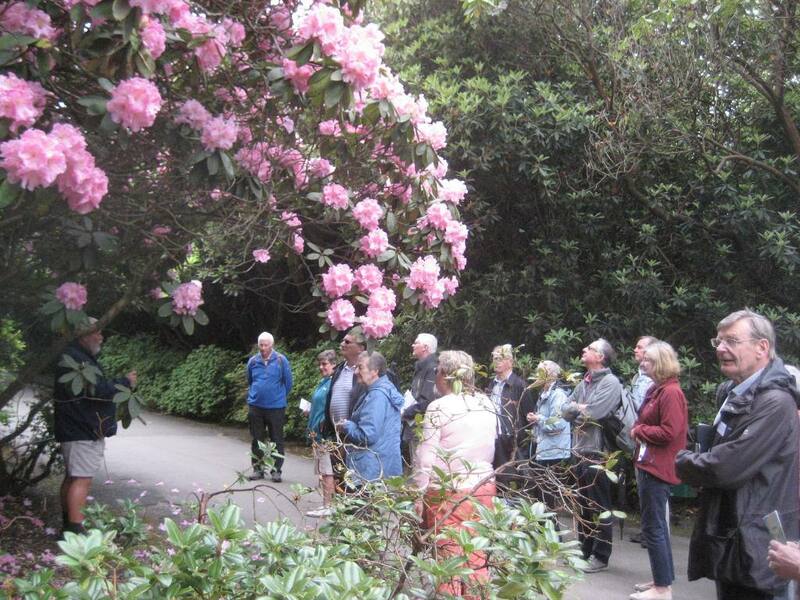 Thursday 7 June saw 31 souls consisting of members, wives, lady friends and some from the Ladies Probus Club of Basingstoke having a splendid trip by coach to Exbury Gardens. Situated at the southern end of the New Forest and adjacent to the Beaulieu River the property was bought by the de Rothschild family in 1918. During WW2 the house was used by General Eisenhower, Churchill and General Montgomery to plan the D Day landings. It has been a lifetime’s work for several generations of the de Rothschild family in creating one of the finest woodland gardens in the country extending to of over 250 acres. 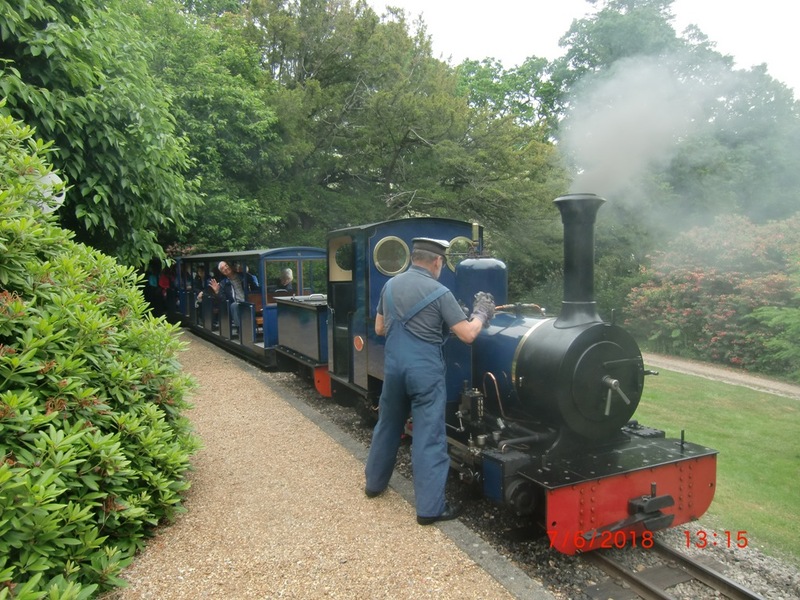 Described as, ”bankers by hobby, and gardeners by profession” the gardens also include a narrow gauge steam railway conceived in 2000 and taking over two years to bring to fulfilment. It was the dream of Leopald de Rothschild, who had been denied a model railway as a boy. 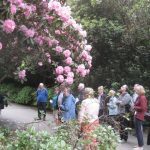 It had been hoped that the rhododendrons would still be in bloom but this year’s spring weather put paid to that although there a few late varieties still in flower. 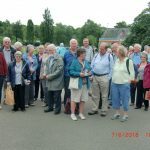 The group had the benefit of a guided tour while some less mobile used the services of a golf buggy complete with informative driver. 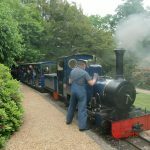 The afternoon encouraged a ride on the steam train which took in parts of the garden not accessible on foot. 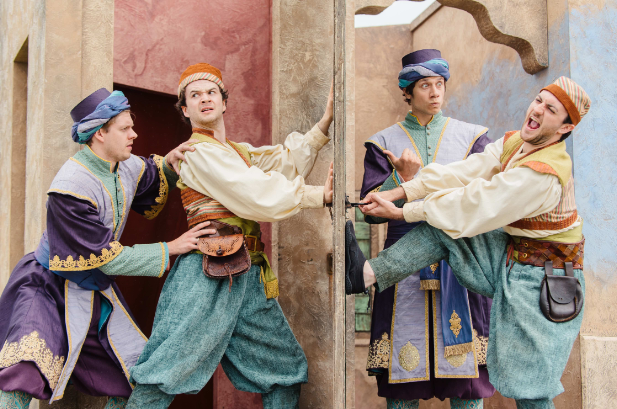 You can find the latest article from Hampshire and Isle of Wight Trust here.